What: Shares of software giant Microsoft (NASDAQ:MSFT) jumped 19.5% in April, according to S&P Capital IQ data, as investors reacted favorably to strong performance in revenue, earnings, and cloud-services growth in the company's third-quarter earnings. 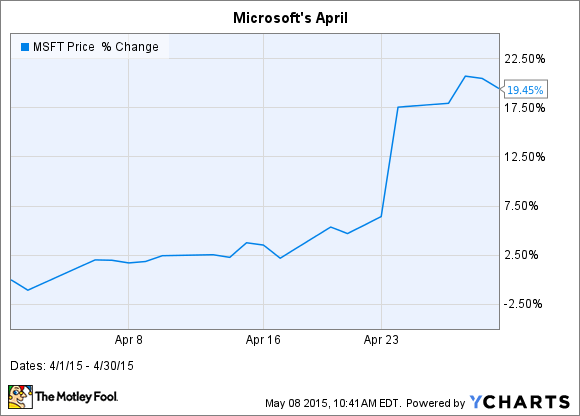 Including April's strong performance, Microsoft is up 21.2% on a one-year basis, outpacing the greater S&P 500's performance of 12.5%. So What: For Microsoft investors, this is continued strong financial performance from CEO Satya Nadella, who's been CEO for about 15 months. The company's third-quarter earnings of $0.61 per share were a beat of 19.6% over analyst expectations. On a top-line basis, the company reported net revenue of $21.7 billion, beating analyst expectations of $21.06 billion by posting year-over-year revenue growth of 6%. Shortly after taking the reins from Steve Ballmer, Nadella changed the focus of Microsoft by modifying Ballmer's characterization of Microsoft as a "devices and services company" to a "mobile-first, cloud-first" company. And Microsoft is overperforming in the cloud. In the recently reported quarter, the company reported 106% year-over-year commercial cloud revenue growth as Office 365 and Azure continue to reward investors. Now What: For Microsoft investors, it appears Nadella's "mobile-first, cloud-first" strategy is taking hold. In the quarter, Microsoft again grew commercial cloud revenue triple digits -- its seventh consecutive quarter of triple-digit growth. The company now has an annual run rate (read: projected performance) from its commercial cloud segment of $6.3 billion. Not only that, but the company is prepping its next big Windows release -- Windows 10 -- to bolster its mobile strategy. The company promises a "single, unified platform for desktop computers, laptops, smartphones, and all-in-one devices" in order to improve the experience for mobile users. Early reports are Windows 10 has a feature, Continuum, that changes its behavior based on device and user interface in order to personalize and improve the experience. And while Microsoft's mobile strategy has its work cut out for it, as Apple's iOS and Google's Android dominate with smartphones and tablets, the company appears to be rewarding investors well mostly on cloud revenue growth. If the company can push into mobile in a more meaningful way, then investors should be further rewarded.